We sure were VIPs that night at the bar! (Very important POP!) I know lame joke but was funny at the time. My friends and I decided to go for a group costume this year. I (orange crush) sewed all the costumes and we have a few artists in the group who painted them! They turned out great and were a hit! 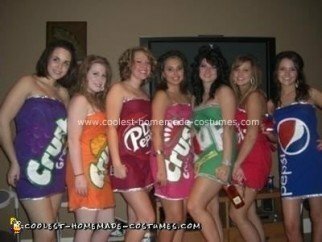 These homemade pop can Halloween costumes are pretty simple to create, I just sewed some tube dresses and added a silver trim and painted them with fabric paint. We all added our own little touches to our outfits to make them our own. I kept a bunch of pop can tabs and made a head band with them. You can also use them for a necklace or bracelet. my daughter and her friends want to do something together this year and this is a great idea. What kind of fabric and paint did you use? Hey! Very cute idea..can you give more step by step directions on what products/dresses you used? Did you use dresses you already had or what? And how did you get the designs on the dresses?